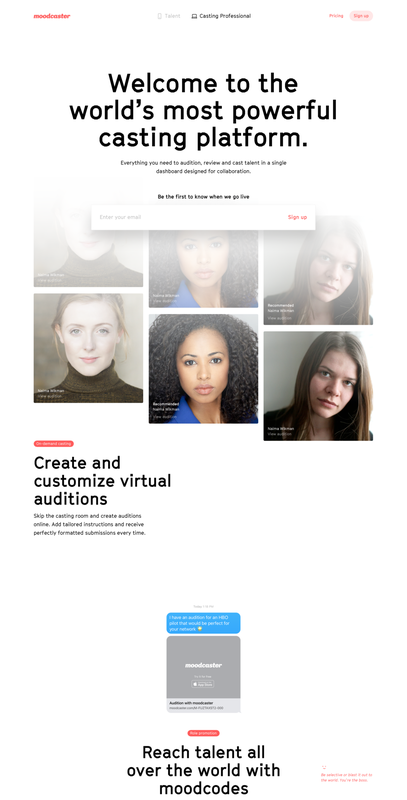 Moodcaster is a web and mobile app that allows talent and casting professionals to connect on a single platform for the first time. Doberman worked with the two co-founders to develop a distinct voice and tone that speaks to both audiences seamlessly. With a happy working relationship set in motion, the client re-engaged our team during the same summer to design the landing pages for their Fall product launch. Coming from a content strategy and journalism background, I wrote a significant portion of the Brand and Tone Guidelines, alongside the Creative Director and team. This included the "moodcaster is always" rules as well as the "Voice in Action" examples and tips. During the Landing Page engagement, I led content strategy and created prototypes for the developer. 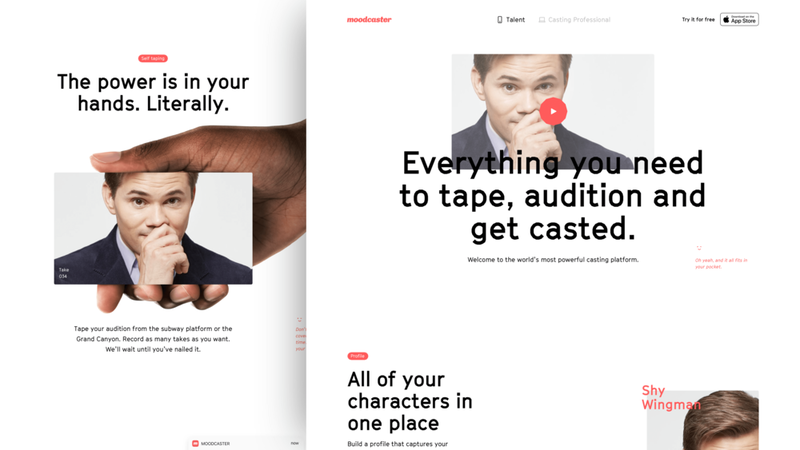 Moodcaster connects talent and casting professionals on a single platform for the first time ever. Each audience had different needs and personas to address through product-related copy and tone of voice. Young acting professionals ranging from 18-30 y.o. 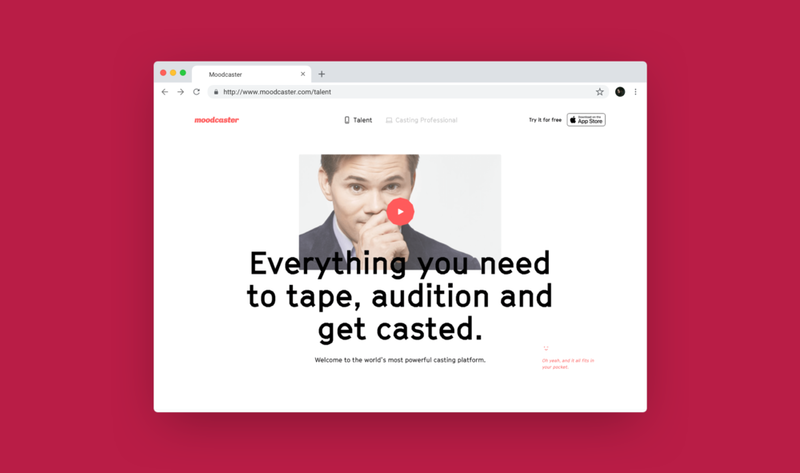 Moodcaster helps them connect with casting houses, brand themselves, and manage their auditions and demo reels without extra fees. Individual to enterprise level casting professionals. 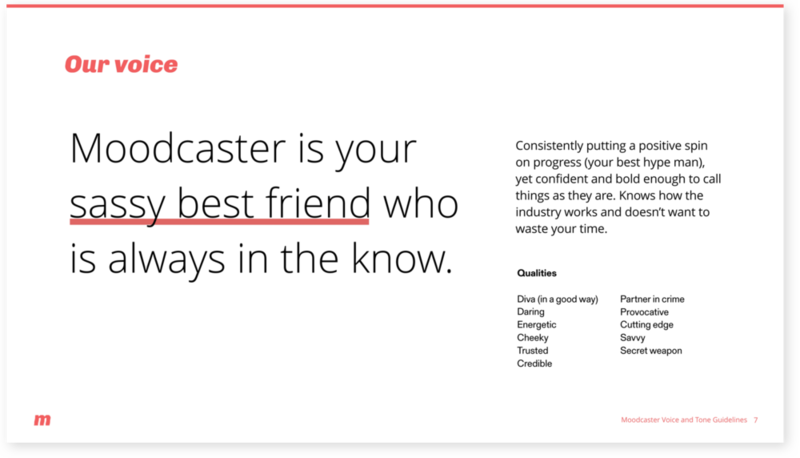 Moodcaster helps them promote roles, receive auditions, and manage contacts and projects—all in one collaborative platform. For moodcaster, it was critical to engage both customers with a cohesive brand. We carefully struck a balance between veteran industry expertise (for casting professionals) and cheeky, conversational friend (for young talent in their 20s-30s). We launched the project with a day of fun exercises with paper, pen, whiteboard and good ole’ word associations. The goal was to understand our client and gather inspiration material. We created three personalities that could be the voice of moodcaster. Using characters like Elijah from the show Girls and Judd Apatow as proxies helped the clients personify each personality. to help craft the company’s customer messaging for the first time. 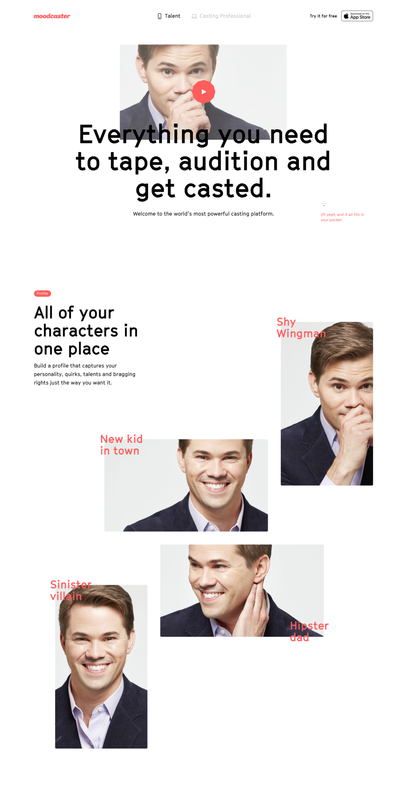 Our comprehensive guide brings moodcaster’s personality to life. 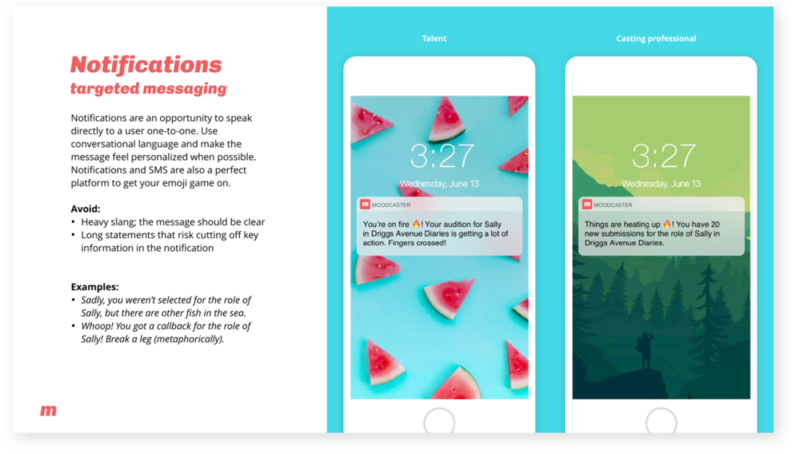 Spanning high-level concepts to the nitty gritty grammar details, we equipped the moodcaster team with the tools they need to embody their brand across diverse communication paths. Moodcaster’s unique challenge was speaking to two different audiences at once. 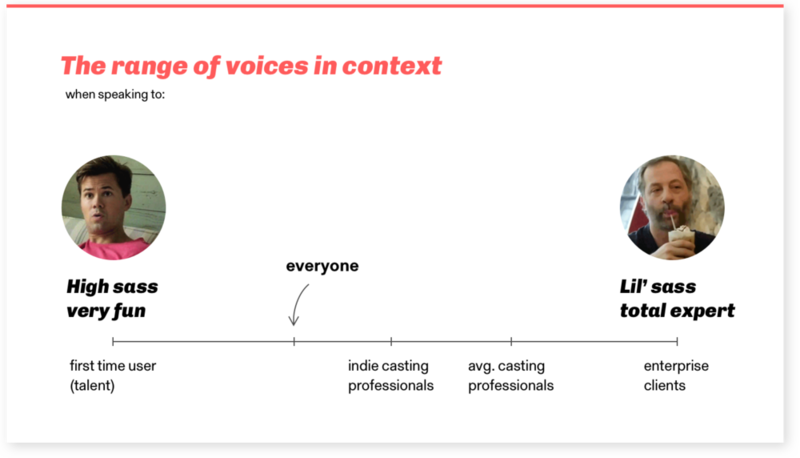 We outlined where on the spectrum of casual to professional their brand voice should live, and how it can flex differently depending on the specific customer they are speaking to. It’s always difficult to know where the line is on language. When does a sentence sound so cheeky it becomes offensive; corny instead of clever. 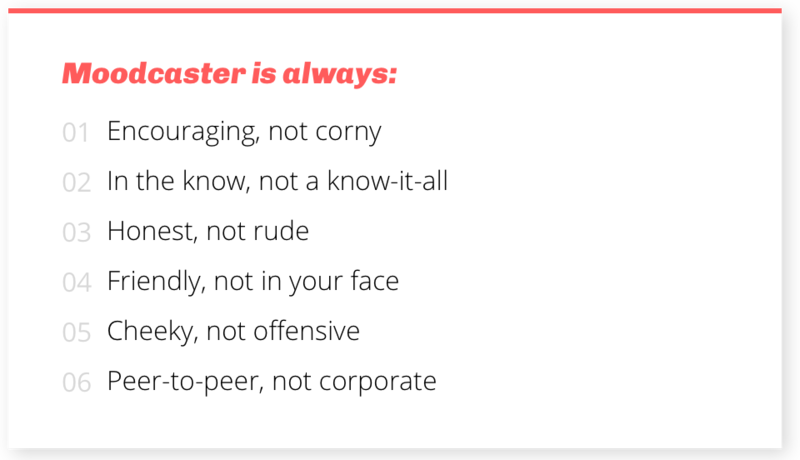 We created six language boundaries through “moodcaster is always___, not ___” statements to guide the moodcaster team upon launch. Examples of confirmation emails, social media posts, notifications and more demonstrate how to use the new guidelines in real life. We provided plenty of do’s and do not’s to round out each touchpoint. Our second engagement was designing moodcaster’s marketing pages for their upcoming product launch. My primary role was writing the copy for both pages, and I really enjoyed flexing my editorial skills. Moodcaster encapsulates “new school.” The platform provides a streamlined way to cast/get cast, that is unheard of in the industry. To capture this essence in the copy we were: Punchy. Convincing. Succinct. The client decided that site visitors would arrive at the casting professional version of the landing page first, as they planned to target that user group first. I created a basic content structure to help us collaborate with the client on what information took priority, and which product features they wanted to emphasize. Getting Visual — Let’s Be Different! When designing their public-facing website, the team knew we didn't want to go the route of typical product landing pages—flat illustrations and product images on blue and white backgrounds. We pushed our client to think bigger and smarter about the narrative, visuals and interactive storytelling. Our visual designer on the team, Patrik, proposed two directions that each put a drastically different skin on the moodcaster brand. I created a prototype for the developer team to show how the casting professional screen should move.